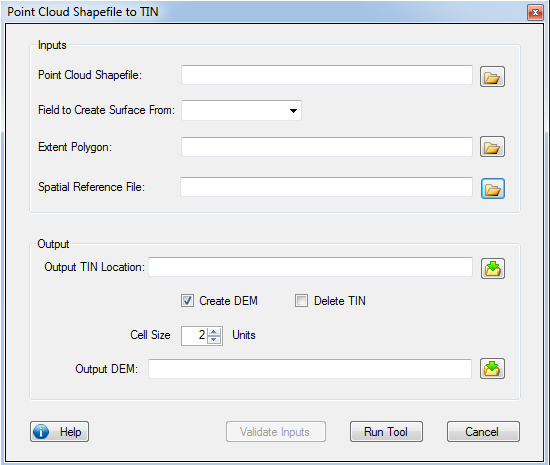 The convert point cloud shapefile to TIN and/or DEM takes a point cloud shapefile of x,y,z values and an survey extent shapefile and converts them to a Triangular Irregular Network (TIN) and gives the option to create a DEM from the TIN. 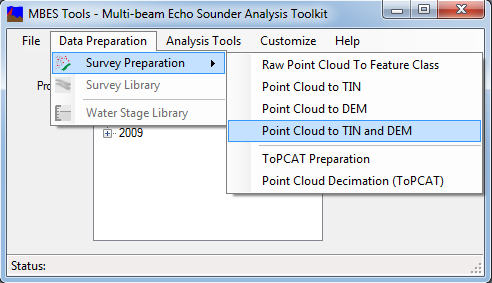 There are many different interpolation methods and options to consider when making a DEM for use in a GCD. For background information for why a DEM created from a TIN was chosen click here. Additionally for more insight as to why 2 feet resolution has been selected as the default cell resolution for the output DEM click here. polygon shapefile of the survey extent for the point cloud shapfile. This can be created through in GCD with the Create Bounding Polygon Tool.